Barnaby Rogerson escorts us around the landscapes and sea-edges of North Africa. He guides us, via pauses and picnics, to ancient footprints and then delivers whole worlds to watch. Nothing is dull or dusty – it is all served with relish, and plenty of sides. The six lives he chooses, in order of appearance, are: a refugee – Queen Dido, founder of Carthage; two generals – Hannibal, and Masinissa; an African king – Juba II; an emperor of Rome – Septimius Severus; and a Christian saint – Augustine. They hold our focus as Barnaby Rogerson swirls us across the top of Africa and into Europe, in the company of politicians, warriors, revellers and worshippers. There are murders, mothers, martyrs and intrigue … and plenty who sweep in from the wings including Scipio, Octavian, and Pythagoras. Hannibal, “the greatest general of all time”, is undoubtedly one of the heavyweights. He gets a large chunk of the second chapter, and brings with him his childhood and family. Together we advance through the divisions in his career, and follow the links out to the Berber general Masinissa, and on to Scipio. By the end we have seen the whole, and it doesn’t end well for any of them…nor for North Africa. He, another African, has a profound influence on the region he grew up in. His grand tale of magnificence and murder begins in Africa and returns to Africa, although the emperor himself dies in York, England. Close to the end of the book we meet Saint Augustine, a man who chooses religion over politics and the military. Bishop, writer, thinker, and one of the Church’s greatest early Christians he leaves us plenty to ponder, much of it still quoted. Barnaby Rogerson shows us all that, but he also provides the context to Saint Augustine’s learning. From Thagaste he moves us on to explore the complex, dangerous world that surrounds Augustine’s early Christian church. Again it is another chapter that might have been a book in itself … but it’s not. Instead, in a close-knit sixty pages, Barnaby Rogerson uses his extensive knowledge to give us enough detailed theological and political background to immerse us in the insecurities of the time. And, like the other strands in this generous book, it leaves us thinking. That is the pleasure of In Search of Ancient North Africa – it is packed with discoveries. There is treasure on every page, and each find stretches on to others, part of a chain to which we’re all attached. 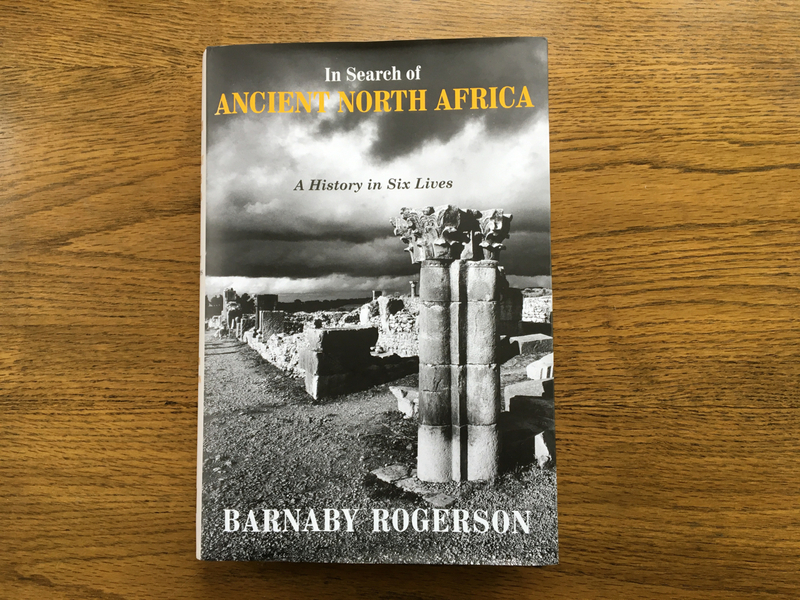 Barnaby Rogerson has written a feast for anyone interested in ancient Africa, or the classical world. It’s ignited a new fascination for me. This entry was posted in Books, Non-fiction, Reviews and tagged ancient history, Barnaby Rogerson, Book Review, Carthage, Hannibal, Haus Publishing, In Search of Ancient North Africa, Rome, Saint Augustine, Septimius Severus, travel. Bookmark the permalink. Thank you, Georgie. I am going to try to read it soon. Right now I am reading a history of the Indians of the Americas. We Europeans and we of European descent need to go beyond our history. You are so right. I hope that you do manage to find the book – and that you enjoy it. I loved the overlap with Italy, especially since we were neighbours to Scipio’s final address!